VoodontWoW: @xafty pretty much with a bit of press yor luck to boot. zarbit: Happens on start phase also. io_Otter subscribed at Tier 1. They've subscribed for 41 months! chaostreader: What is happening in chat right now? Nigouki: is Contra Band the guys who did the soundtrack for the NES game? ArmadilloAL: Dewey, Cheatem, and Howe? nbinney subscribed with Twitch Prime. They've subscribed for 14 months, currently on a 14 month streak! chaostreader: Who were the three caballeros? ralphmaccookin subscribed at Tier 1. They've subscribed for 22 months! 8_Escape: Why a killbot has credits on it is anyone's guess. ArmadilloAL: How else is it going to get refreshments from the Killbot Company Commisary? Stoffern: The big question? Has Paul prepared an apropriate sound effect? ralphmaccookin: Death... by Clank Clank! VoodontWoW: Hoist by your own noisy pitard. EBugle: Lord Eraditcus. I mean Evan. LRRbot: The stream has been live for 21:36.
orionsrise1: damnit! that was a prolonged twitch notice! LRRbot: The stream has been live for 2:37:28.
chaostreader: How does updog work? freshmaker__: I almost asked what the exclamation mark one was in the upper middle circular section, but I realised it was an upside down lock symbol. I'm very smart. VoodontWoW: Teleporting is another thing from some cards, at least in the first game. VoodontWoW: How is Updog not in an Un set? EBugle: It is super cool! ArmadilloAL: Have played this one. Can confirm super cool. djalternative: it's not Ben the traitor? ArmadilloAL: Mulligan the five cards, draw four of the other five, then scry the last card for no reason whatsoever? ArmadilloAL: 3 for Ben, 2 for Ian, 1 for James. ArmadilloAL: If there was a fourth player, they would be 0. Hingadora: I missed the explanation and this is one heck of a board. chaostreader: @hingadora don’t worry. I saw the explanation and am still kind of lost. djalternative: Danger! Danger! High Voltage! Stoffern: So its kinda...Star Trek themed? ArmadilloAL: This is a spaceship. They're playing a deckbuilder, but their decks let them move around the spaceship, get artifacts from the right side of the board, then escape from the left side of the board. chaostreader: Where can you check on the app? EBugle: Lots of sci-fi jokes. ArmadilloAL: @Stoffern It's kind of a big jumble of sci-fi references. EBugle: Dr. Who, Star Trek, Star Wars, etc. kookerhead subscribed with Twitch Prime. lemmel subscribed at Tier 1. They've subscribed for 8 months! ArmadilloAL: Everybody gets 1 clank for yelling "SHUT UP WES...ER, Helpful Prodigy!" in unison. EBugle: No, it's +2 then -2.
freshmaker__: Colonel, I'm trying to hack the command modules, but I'm dumby thicc and the clanking of my clank cubes keeps alerting Lord Eradikus. OldMan_PJ subscribed with Twitch Prime. They've subscribed for 23 months! ralphmaccookin: Goats for the Goat Blood! ChubiQC subscribed with Twitch Prime. They've subscribed for 2 months! djalternative: is it boot or boop? Stoffern: Noisy cricket with the Enterprise serial number? EBugle: Notable, if a boss is flipped more than once in a turn, Evan only attacks once. StalePieceofWhiteBread: Well I know with games like STS you just kinda want to make a goodstuff pile. mowdownjoe: Damnit, Direwolf! Did LSV work on this game? zarbit: LSV is a Direwolf developer, yes. ozuf1: This may not be the best place to ask, but is there a pre-prerelease planned for war of the spark? ExhaustedElox: wow, what a weird looking game. Gotta go to the VOD to learn how this all works. asthanius: I'm now realizing that some people have color-blindness with blues and purples. This game must be infuriating if you have to get someone else to tell you what colors you pulled. StalePieceofWhiteBread: Direwolf also made Eternal, which is also fun! zarbit: I'm playing Eternal sealed right now! It's great! StalePieceofWhiteBread: So that makes him Eddington right? ozuf1: thanks guys! i'll be sure to watch then! StalePieceofWhiteBread: Or is he more of a Seska? ArmadilloAL: I think they've announced that PPR's will be happening for every set this year, including Modern Horizons. Xenguin47 subscribed with Twitch Prime. They've subscribed for 21 months! Xenguin47: Go Go Gadget Bezos Money! EBugle: He used to be a Terminator. StalePieceofWhiteBread: "I haven't been a Terminator in years. I am getting too old for this ish"
Tempest2097: Grabbing out of the old Pot of Greed I see. Hqueso subscribed at Tier 1. They've subscribed for 61 months, currently on a 61 month streak! Hqueso: Just got here. No idea what's going on so I'm making up my own rules. Ben is cheating. TPRJones subscribed at Tier 2. They've subscribed for 49 months! StalePieceofWhiteBread: @Tempest2097 Oh, Pot of Greed? Isn't that the card that lets you draw two cards from your deck? Pal_Friendpatine: The person symbol with the vertical like through it? Door of some kind? StalePieceofWhiteBread: @Xenguin47 This is a deckbuilding game as well! LRRbot: The stream has been live for 49:32. StalePieceofWhiteBread: If you buy the professor is he gonna say "Many Magic the Gathering Players ask the question: is Clank: in Space! worth your money?" chaostreader: No he will tell you to go watch Desert Bus for Hope in November. orionsrise1: so does the legacy show start tomorrow? EBugle: Stumble isn't a program. chaostreader: @browneepoints The website has the schedule. StalePieceofWhiteBread: Farscape is so good! And like, if I remember correctly, doesn't have that much that's super problematic! tokeull: can ian hack now? chaostreader: As proven in the axe throwing video Ian and James can hack it. VoodontWoW: Hackity hack, don't clank back. StalePieceofWhiteBread: It's the name of the game. hOw bAd CaN iT bE? Bionull: I like this game a lot, but I feel like it needs more pressure for the clank. I liked the first game giving you 4 turns from the first escape. TabbyLavalamp: I just got here. Mind re-starting so I know what's going on? tokeull: when does game end? Bionull: It's just 4 cubes every time an escaped/dead player takes a turn. zarbit: Escape timer is now just pulling cubes on the escaped/dead player's turn. dumbo3k subscribed with Twitch Prime. They've subscribed for 18 months, currently on a 1 month streak! Bionull: I like the card options in Space and the extra little things of the hacking. It's pretty much just original plus more stuff aside from the escape change. zarbit: I miss the draw 3 card the most. Bionull: There's at least 2 cards that can draw 3 in space. VoodontWoW: @StalePieceofWhiteBread Definitely. Original also has 2 expansions and a mini-expansion if that's your jam. VoodontWoW: @StalePieceofWhiteBread Ahh, well many FLGS that have demo copies tend to include Clank. StalePieceofWhiteBread: @VoodontWoW Yeah I think my FLGS has one! Hqueso: "boot juice" does not sound very thirst quenching. VoodontWoW: Boot Juice: Don't Ask How We Make It. PMAvers: Real Artisnal Boot Juice: ethically sourced from the sweat of real factory workers. Despoiler98: I would like to Rage? chaostreader: Kill a dude and make less noise. Meowgoocat: Wait, you don't spend the crystal do you? Dread_Pirate_Westley: You don't spend the power crystal. Bionull: The crystal is a threshold, yeah. Not spent. TheKingWiggins subscribed at Tier 1. They've subscribed for 4 months, currently on a 4 month streak! Dread_Pirate_Westley: There is a card that lets you sell excess power crystals. Bionull: There's also a card that draws per crystal, which is sweet. StalePieceofWhiteBread: "you can't fight with boot juice! That's silly!" chaostreader: Explain the crystal stuff to me please chat. In detail. zarbit: Doppelganger is a favorite. chaostreader: Oh okay that’s much clearer. ImDunne98 subscribed with Twitch Prime. They've subscribed for 2 months! Pnoy__: did he remove the stumble? chaostreader: That thing Luke bought and didn’t get in Star Wars? PiGuy2000: Clank! in space! I don't even know how to play Clank not in space! ImKevinTheShark subscribed at Tier 1. They've subscribed for 33 months! ImKevinTheShark: Oh here you are Ben! I found you! Chomp Chomp! Bionull: I like that these super space thieves just trip every couple minutes. dtrain_67 subscribed at Tier 1. They've subscribed for 8 months! CompSciJedi: light... tennis shoes? Wait, wouldn't those just be what we all had in 3rd grade? TabbyLavalamp: Light light rail transit. zarbit: Spanner drawing a Stumble is my wife's curse. PMAvers: Now, which is more of a mess, this, or a Galaxy Trucker ship made out of pipes and building materials? rogerivany: Jeez, that's a reference. When was Hackers released again? Rockario: Best movie of all time between 1994 and 1996? orionsrise1: best movie of all time is Freddie Got Fingered! PMAvers: It's a bad movie that wraps around to being good again due to being so bad. Like the Power Glove. Despoiler98: best movie ever is Blues Brothers FIGHT ME 1v1! Hqueso: When I was young, you had to be born in '45 to be old! You youngsters and your modern dates and time-moving-forward! Bah! chaostreader: I was -4 when that movie came out. ninja_theory_ashrams: Actually, it is not hard to find articles from 1995 saying how accurate the depiction of hacking in Hackers was. tokeull: also not born back then. chaostreader: @contingentcat I’m still mad about Desert Bus with the pauses made longer. chaostreader: Whenever chat pauses for a long time without a new message I start getting worried. zarbit: You can ignore artifacts. orionsrise1: you know what other movie was good? StalePieceofWhiteBread: arguably isn't The Terminator an Ex-Terminator? He betrayed the terminators to save Sarah. superdude097: Is this game co-operative, free-for-all, or co-op with individual goals? Or something different? Bionull: I do think it's awkward that the factions are too sparse to really build to. chaostreader: She had a name that I can’t remember. ninja_theory_ashrams: welcome to, PHLOSTON PARADISE! orionsrise1: the Fifth Element is a poor man's Blood and the Stone! PMAvers: It's got his Pokemon save on it with all 150 from Red & Blue! EBugle: I appreciate your shapeshifter has turned into a pair of noots. Dread_Pirate_Westley: Riding two scooters helps you move faster. Apparently so does having two pairs of shoes. EBugle: 2 boots for your feet, 2 boots for your hands. EBugle: Ian, Big Risk, Horner. breadisbest1 subscribed at Tier 1. They've subscribed for 7 months! StalePieceofWhiteBread: @earthenone something like this happened with my buds and it was "buce"
LRRbot: The stream has been live for 11:10:55.
ninja_theory_ashrams: is it a "sonic" spanner? aedriel91: Quick question, anyone knows when LRR will stream the Pre-Prerelease to War of the Sparks? PMAvers: Underworld Contact? Of course it's worth a credit. phenexian: @BrowneePoints A spanner is a wrench which can be fastened, while a wrench has a fixed size. StalePieceofWhiteBread: I choose to believe it's actually called boot juice. TwoMenInAHorseCostume subscribed with Twitch Prime. They've subscribed for 9 months! EBugle: No, you're just at Plaid. PMAvers: Too bad they havn't banned plaid yet, since it makes AI's go insane. chaostreader: Red and orange look very similar on camera. StalePieceofWhiteBread: Because Ben is the traitor! StalePieceofWhiteBread: so when that fills up I assume that means... you get ice cream? BrowneePoints: @phenexian well being a huge Star Wars nerd when I realized that a Spanner is a wrench it blew my mind on the term "Hydrospanner"
Lysander_Gustav: Some sort of sci-fi game? BrowneePoints: @Lysander_Gustav Sci-Fi version of Clank! Dread_Pirate_Westley: Doesn't he have a laser sword? LRRbot: The stream has been live for 1:52:09. Lysander_Gustav: Intriguing. Is it just a re-skin of the original or are there new things besides that? EBugle: When you die or boss attack, you pull 4. EBugle: Regardless of the the bosss tracker. chaostreader: Wait someone said something. LRRbot: The stream has been live for 1:53:59. Dread_Pirate_Westley: @Lysander_Gustav There are significant changes. You can't just grab the 5 point artifact. LRRbot: The stream has been live for 1:54:33. AchillesAndTortoise: ian still scores, right? chaostreader: No Ian still scores his cards. Lysander_Gustav: I haven't heard of Clank before, but I do like heist and theivery games. Is this competitive or teamwork? chaostreader: Ben needs to leave Now! phenexian: I think I prefer El Dorado (another deck building race game), this game is a little too messy for me. Kukako: I have played this two times. Everyone lost on both occasions. Pretty hard game. PMAvers: Daddy Savidan would be proud of this greed. Bionull: I don't think there's any way the red cube doesn't end up in the bag every draw. chaostreader: Ben starts at 20 right now for overlay? asthanius: Same as the storm count, tho! Earthenone: both off by 2! Nigouki: well you got two more hours to do it again! PMAvers: Well, you could pull something quick out, like Welcome To. Gekyouryuu: fill time with geoguesser? StalePieceofWhiteBread: how about a quick game of Diplomacy? 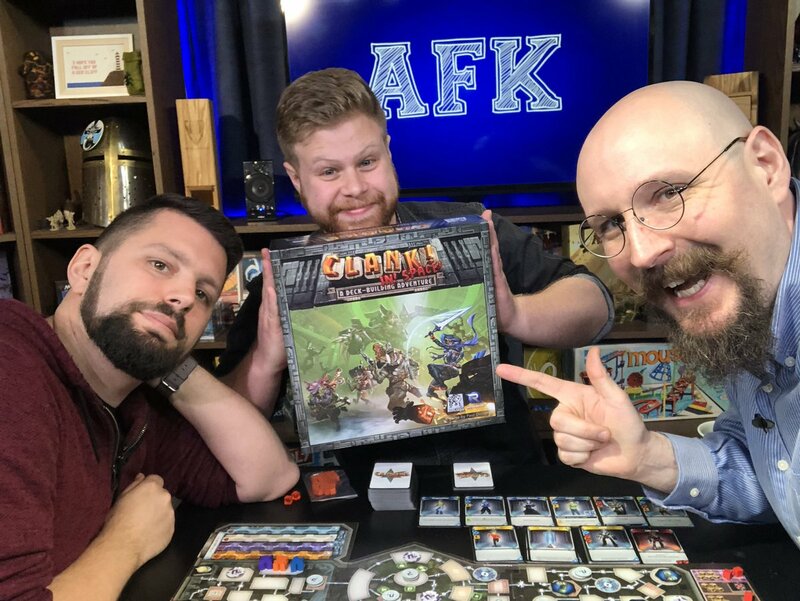 EBugle: Yes, Clank! games are all awesome! StalePieceofWhiteBread: #jokes go get some sleep and food! EBugle: Legitimately my favourite board game. orbitaltuna: what's bonus stream tomorrow? tokeull: it is 4 am here i need some sleep. Hqueso: Now I'm waiting for the mailtime in which they get several dozen decks of playing cards. Nigouki: what's the star wars thing on the shelf under Baldur's Gate? Jokulhaup1234 subscribed with Twitch Prime. They've subscribed for 66 months, currently on a 66 month streak! Soulsinger_Again: I feel like watching these guys play Munchkin would turn the Moonbase into a crime scene. Kumakaori subscribed with Twitch Prime. They've subscribed for 21 months! PMAvers: The original The Playthrough. Rhynerd: I think the next mailtime will be before the skin arrives. PMAvers: Well, the next mail time will probably be Feb and March stuff, so they dodged a bullet. Dryhad: You still do Magic stuff? Do you still make Friday Nights? Rhynerd: so, the second upcoming mailtime will be full of skin, unless we decide to be merciful and not mail all our skin. red_shoes_jeff: BUT WHO WILL PLAY KRANCOR!? Doc_Rider: Why not Betrayal Legacy? Despoiler98: Is there ever going to be another Crossing the Streams? Rhynerd: I know when I'm doing my sub notifier tomorrow. chaostreader: @earthenone That’s what they’ve said. Soulsinger_Again: @Earthenone Isn't that just going to be Ben betraying different parties across generations? Gekyouryuu: @Earthenone I'm sorry, there's a BETRAYAL LEGACY?! Soulsinger_Again: WHY is James' giant hole so watchable? chaostreader: James digs the Hole thing. Despoiler98: so is crossing the streams gone? red_shoes_jeff: Please speak no more of James' hole. chaostreader: @gekyouryuu I almost bought it at Pax but I don’t have a dedicated play group. Soulsinger_Again: @electric_claire You just kind of fall into it. Juliamon: Despoiler98 it's the same as it always is, in that it'll show up when there's a relevant game. Hqueso: OK, now give me that sweet, sweet recognition. I crave approval to a pathological degree! Despoiler98: @Juliamon I suppose but its been....years? since its been done? thundershot879: so now that they have done clank how long till eternal? Hqueso: Thanks for the stream! See you at other times when things happen.